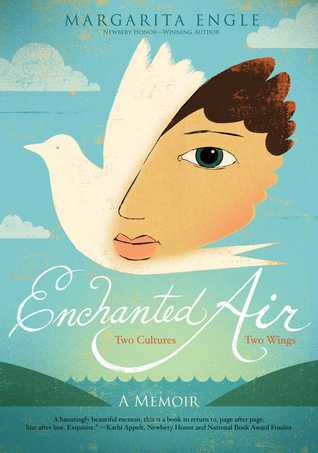 Enchanted Air: A Memoir by Margarita Engle. Grades 4-7. Atheneum Books for Young Readers, August 2015. 193 pages. Reviewed from ARC provided by publisher. Margarita is a girl from two worlds. Her mother is Cuban, her father is American, and from the first time that Margarita set foot on the island of Cuba, she knew that Cuba was a place where she could really be her true, authentic self. Cuba is a beautiful island, full of lush, vibrant flowers and interesting animals. Margarita sees is as a fairy tale kingdom and she loves her family there and the stories they share. Back in America, Margarita feels like she doesn't fit in. She's smart and skips a grade, making her younger than her classmates. She identifies more with books and stories than with people. She constantly longs for summer to arrive so her family can travel back to Cuba, back to where Margarita really feels like she belongs. But when revolution breaks out in Cuba, Margarita's worlds collide in a terrible way. The United States and Cuba are at war and Margarita fears for her family and for the island that she loves. Will she ever be able to visit her fairy tale island again? This memoir in verse shows a child's-eye view of the Bay of Pigs Invasion and the Cuban Missile Crisis with author Margarita Engle caught in the middle of it. In spare prose poems, Engle is able to convey strong emotions and she clearly illustrates the connection that she has with Cuba and her family living there. Engle paints a picture of growing up with two cultures, two languages, two ways of seeing the world. She first learns that teachers can be wrong when she draws a picture of Cuban trees blowing in the wind and her teacher says "REAL TREES DON'T LOOK LIKE THAT." And Margarita realizes that she has a unique worldview, that not everyone can see the things she sees. The child's experience of the conflicts between America and Cuba are authentic. Engle really writes from her child self's point of view. Young Margarita doesn't always know what is going on. She knows that her family is watching the news more than ever before. She knows her family is in danger and that she may not ever be able to go back to Cuba, but she doesn't really understand why. It shows the senselessness of war, which continues to this day. This is a luscious book and a valuable perspective to share with children. I learned this year that some of our middle school students are required to read memoirs as one of the genres they explore and I'll be excited to bring this one to their attention this school year. As I was reading, I kept thinking of the excellent memoir in verse Brown Girl Dreaming by Jacqueline Woodson. I think there are many similarities: carefully crafted sensory writing, the experiences of young girls growing up in a tumultuous time and caught between two cultures, obvious love for the places of their youths. Two fictional books about children growing up in Cuba and then experiencing life in America via Operation Pedro Pan (which brought children to the US to escape the violence in Cuba during the revolution) are The Red Umbrella by Christina Diaz Gonzalez and 90 Miles to Havana by Enrique Flores-Galbis. And, of course, readers may also enjoy reading Margarita Engle's historical novels in verse, particularly knowing more about the author's heritage and relatives.